A six decade tradition in Des Moines with fun for the whole family. 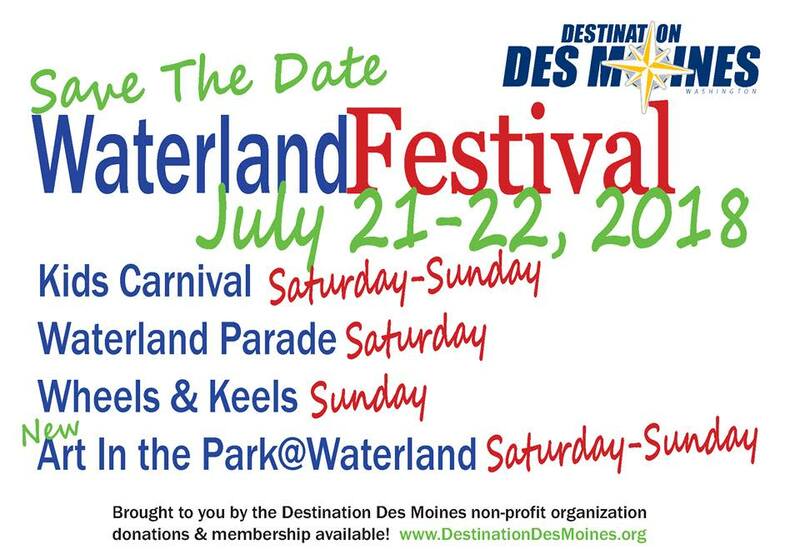 A Seafair Festival sanctioned community event, the Waterland Festival returns July 21-22nd to the Des Moines Waterfront. This year for the first time, an arts fair joins the Waterland Festival line up of events. With more than 30 booths including fine art and craft artists, visitors can meet the artist and purchase unique and locally handmade goods. Waterland Parade - Saturday @ 6pm with Seattle Seafair Pirates and Seattle Seafair Clowns. Waterland Kids Carnival - Bounce House Fun at the Beach Park Saturday & Sunday. Waterland Wheels & Keels - car & wooden boat show at the Marina Parking lot Sunday 10am - 4pm with food, music, beer garden. NEW Art in the Park at Waterland - Fine Arts & Crafts show in the Beach Park meadow Saturday, 10am-6pm & Sunday, 10am-4pm.